IchigoBankai, one of the most well known video game collectors in France, is famous for his amazing video game cartmoddings and reproductions. In this well elaborated interview, I speak with Ichigo about many of his projects. Gordman: Hi Ichigo, thanks for your precious time to make that interview with me. At first, tell us a few things about yourself please. Gordman: At which point of time you got interested in reproductions and how did that happen? Was it a specific game that was essential for your decision to create your first repro? Ichigo: One day (in 2007) I´ve found a french website which explained how to put ROM´s into real cartridges… After hours of reading tutorials, I decided to make my first repro: Chrono Trigger on the Super Nintendo. An excellent RPG made by Square and Akira Toriyama. 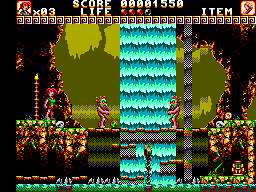 This was considered as a "difficult repro" (not really for "beginners"), but with bit of thought it was an easy task. 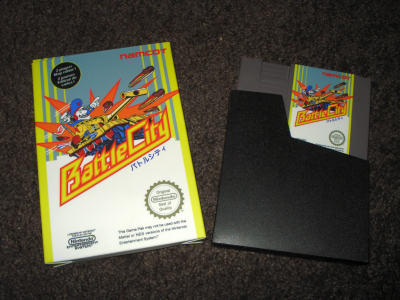 After this, I made Battle City (a Famicom game) ported into a PAL format (I made it for my wife, she loved this game when she was young) and Wonder Boy in Monster World IV (Mega Drive), another game I really love. Gordman: You made a lot of reproductions. Not only for the Sega Master System, but also for the Mark III, the Mega Drive and Super Nintendo. Conspicuous is the fact that almost every game is in your first language: French. Were you tired to play the games in english or another language you don´t understand? On the other side, some games were never ported on the japanese format. 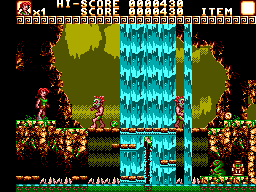 Like the fabulous Wonder Boy 3 (Monster World 2) which includes the FM sound or Alex Kidd in Shinobi World… Thats why I've made few Mark III repros. I'm just lacking of a japanese translator (english or french to japanese) to complete them. 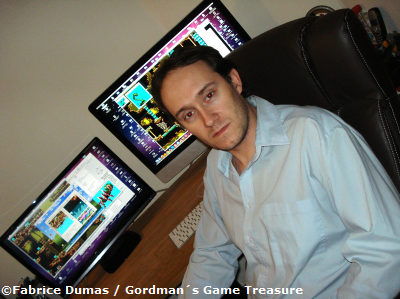 Gordman: You brought many japanese games to the european consoles, like Pulseman for the Mega Drive, Solomon´s Key for the Master System and Zelda: Ancient Stone Tablets for the Super Nintendo. Would you say that it´s a shame that so many games were only released in Japan? How complicated is it to translate the games from japanese into french/english? Ichigo: YES! Too many jewels never came to us. Difficulty to translate a game varied from game to game. You must have many skills if you want to do it alone. Usually a translation is made by "teams" (like Aeon Genesis -an English team- or Terminus traduction -a French team-), or a few people with different skills. Some games have compressed datas (in fact nearly every RPG) and you must write your own "tools" to extract/recompress texts, pictures… For example, Solomon's Key was a simple game to translate, there was only the titlescreen in Japanese^^ If you're searching after an translated game, you can take a look at romhacking.net (in France we have traf.romhack.org). Many countries have teams. 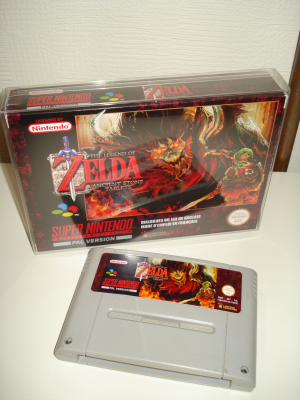 Gordman: Stay at Zelda: Ancient Stone Tablets – This game was released in Japan for the Satellaview, a japanese only-attachment for the Super Nintendo. What made you decide to create a PAL version of the game? Ichigo: The PAL format is my country^^ Even if my console is region free, I love making PAL boxes. This game is quite special, it's very big (64 mbits or 8mo) mounted on 2 TSOPs (tiny 29F032 memory, 32 mbits). Usually I explain "how to make" repros, but in this special case i never show the complete electronic part or logic. Ebay is full of f*ckin´ crappy sellers. And unfortunately Zelda is equal to "a lot of money". So I've only made one for my own pleasure. 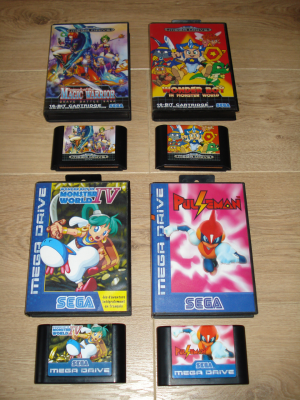 Gordman: Now let´s come to the big gems under your repros: The Master System ones. I start with Golden Axe Warrior: Again, you translated the game with the help of existing translation patches. This time from english into french, and the game has it´s own artwork again too. Some special things are the key ring and that amazing map. Tell us the details about it´s development please. Ichigo: For me, Golden Axe Warrior is an underrated game. It's the "Zelda" for the Master System, but nicer! The map was legitimate for this game, like for every existing RPG. I've drawn elements, scanned and vectorized them in illustrator (to convert it in a vectory form) before importing them in photoshop. Like this I could extend or shrink elements (like mountains) without loosing any details. The resulting photoshop file is quite large (300mo). The Palma map for Phantasy Star is even bigger (500mo). These files are made in 300 dpi (dots per inch) = 4961 x 3508 pixels (A3 size). Then these files are professionally printed (with contacts from my job). Gordman: You created Alex Kidd Memories, a 4 in 1 game. 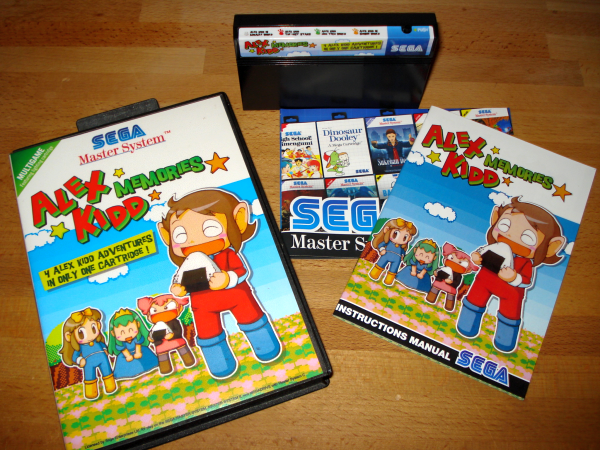 It contains Alex Kidd in Miracle World, Alex Kidd: The Lost Stars, Alex Kidd: High-Tech World and Alex Kidd in Shinobi World. It seems that this is your personal appreciation for the Kidd? Gordman: Alex Kidd Memories has a very special cartridge: What´s the idea behind that special switch? Ichigo: To make repros is quite simple either, so let's try to innovate! The switch is here to change the game without having to turn off/on the console. Initially I thought about 2 options, with the reset button (but the Master System 2 does not possess it…so no) or power cycle on/off the console (like the "Master Games 1" cartridge). The easiest and most practical is to do it with the switch, so I chose this one. To complete the repro, I decided to "illuminate" the SEGA on the sticker, allowing to know which game is selected (with one color for each game). 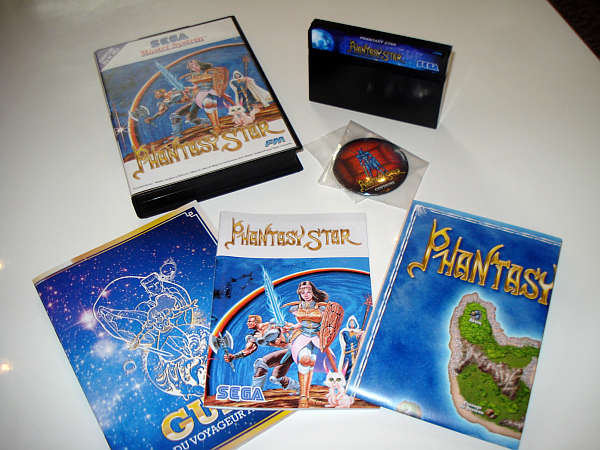 Gordman: Another example for your good work is Phantasy Star. Do you use all the artworks and pictures from the japanese versions for creating your own artworks and instruction manuals? Or do you create own graphics sometimes for the instructions? Ichigo: Japanese artworks are far better than our "poorly" european ones (especially on the Master System). If I can´t find good pictures (very high definition pictures), I redraw them. Like for Wonder Boy in Monster World IV, I've completely redraw Asha for the cover (on illustrator). On "Brave Battle Saga", I've redraw some parts to match the game (which is itself a chinese mixture of various elements picked from other RPG´s, like Breath of Fire 2). For Phantasy Star, I've taken illustrations from many many sources. Original japanese manuals, Playstation 2 version, Phantasy Star "futabasha/Adventure book", Phantasy Star Official - Production Compendium… I always spend many hours searching for good elements. Gordman: Do you think that Sega ought to put in goodies like the buttons and keyrings in their games as well like you do it? Ichigo: Back in 1990s, "Collector's Edition" didn´t really existed. But for sure, it can be a really nice collector´s item. For Phantasy Star, Golden Axe Warrior as I've made tiny series of these games, I wanted to make them as unique (and great) as possible. Gordman: Would you give away the secret what your next project should be? Y´s The Vanished Omens in french, it already exists a translation but far too buggy for me. So I've started to translate it from scratch. All texts are dumped, ~40% of them are translated. Two compilations like Alex Kidd Memories : Wonder Boy Legend (or Anthology, with Wonder Boy 1,2,3 & 4) and Sonic Superstar (1,2, Chaos & Spinball). The electronic part of the Wonder Boy is already made. But now all my free time goes on LOST RAIDER! Gordman: My last question is about Lost Raider, the homebrew game made by Vingazole and yourself. It was your entry for the SMS Power! Coding Competitions in 2012. Is there a chance that you both will finish it to a full game one day? Gordman: Thank you very much IchigoBankai for spending your precious time to answer my long questions. I wish you all the best in the future! ..and a big THANK YOU to Fabrice for his readiness, patience and involvement for making this interview!